Fresh content will bring spiders (and people) back to your site more often. How often you update your website is extremely critical to your success on the web. First and foremost, search engines loves fresh content. Let's take two sites that cover the same topic. Site A who updates their site every month and Site B who hasn't updated their site since they created it. The search engines only have "so much time" to index sites. If the spider comes back and finds that information has changed, it will normally decrease the time between now and its next indexing (to see if there were even more updates that have happened between crawlings.) If the content hasn't changed it might increase the time between its last crawl and its next crawl (assuming that if it wasn't updated lately it probably won't be updated next time either). Regularly updated content will bring spiders back more often which leads to faster indexing. Now, what if both sites decide to run Christmas specials and both update their sites. Which Christmas special will be seen sooner and thus have a better chance of being effective? 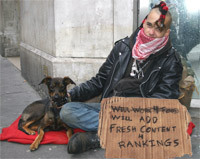 Besides being great for search engines, fresh content is great for real life humans. People love getting the latest information about everything. Updated content also builds trust in the information you provide. If you haven't updated, people might think that you have gone out of business, or don't care about keeping your customers updated, or don't carry the latest product that the competition has on their site. Another benefit of new, fresh content is that it builds authority into your site. As you add new pages about your products, services, or frequently asked questions, you further strengthen your authority of that subject. You show that you really know your stuff. More people will be willing to link to you because you have the answers that they are searching for. It also creates extra miniwebs or natural doorways into your website which will help your clients find you from even more keywords. With the popularity of blogs and other mechanisms for publishing content quickly on the web, the importance of updating your site has increased exponentially.